During the hurricane and storm season many homes in America’s southeast are damaged. Thankfully log homes are strongly engineered and usually stand up very well to violent winds, torrential rains and pounding hail. There are numerous accounts of log structures that remain standing when a storm destroys everything else in the immediate area. Even the most stoutly built home will take some damage during a storm, log cabins being no exception. After a strong storm or hurricane it is important to inspect your home for damage or call us at 800-781-2551 for a onsite inspection by one of our log home repair experts. If you have found damage to your log home please call us immediately. We will come to your location and perform an inspection generating an estimate for repair if needed. We will even support you as you work with your insurance company, and make sure that your home is put back to the way it was before the storm or hurricane. Our goal is to ensure your happiness, so we have partnered with many companies to not only give you the best repairs, but also make sure they are done at the lowest cost possible. 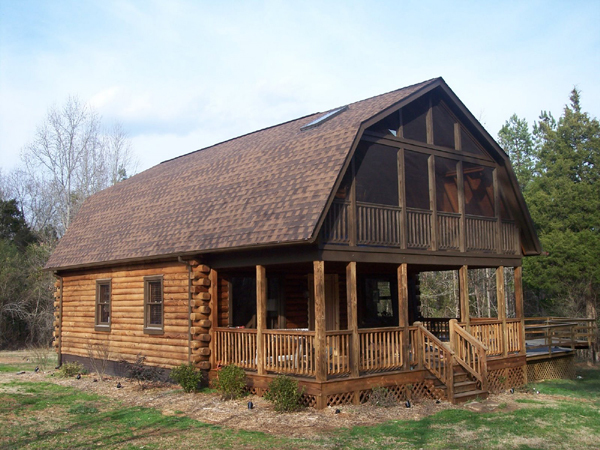 Performance Log Finisher’s experts have completed hundreds of storm and hurricane damage repairs to all types of log homes. Visit our testimonials page to see what others say about us. Some of our past customers welcome you to call them to find out more about or service. “I just want to thank you as I will thank the guys – the experience with them was nothing but wonderful. They were professional, informative and just great to talk to.